The Sierra Madre Tattler! : Did You Receive This Flyer About The Next Library Forum In The Mail? Can You Find The Big Mistake? Did You Receive This Flyer About The Next Library Forum In The Mail? Can You Find The Big Mistake? This flyer is the work of the Friends of the Library. I confirmed that with the always accessible City Manager, who answered my email on a Saturday. So did you catch the big mistake? January 24 is on a Wednesday this year, not Thursday as this flyer erroneously states. Which could mean that some sadly misled folks will be getting their worthy selves to this latest Library Forum a day late, and will miss out on the most up to date demolish the library marketing pitches. Just so you are completely aware, the correct date for Library Forum 2 is Wednesday, January 24. This event will be taking place at the Recreation Center, located in Sierra Vista Park. Not exactly what I would call a neutral site since that is the place where both the Library Board of Trustees and the erstwhile Friends of the Library want to move all of those books once the current Library is mulched and the property sold off. I am pretty sure this is not a coincidence. The format for this get-together is quite different from the first forum. 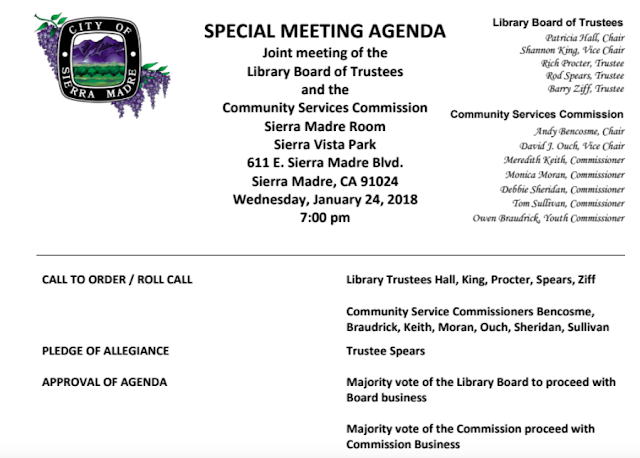 Apparently it is a special meeting, with some of Sierra Madre's leading visionaries on hand to explain the Library relocation stratagem to anyone who happens to wander by that evening. Have I ever told you that the fix is in? Who amongst the situationally elevated listed above is going to actually come out and say that they want to keep the Library where it is and save everyone a whole lot of money and bother? Well, perhaps one or two will. Maybe. But that is it. Think of it this way. 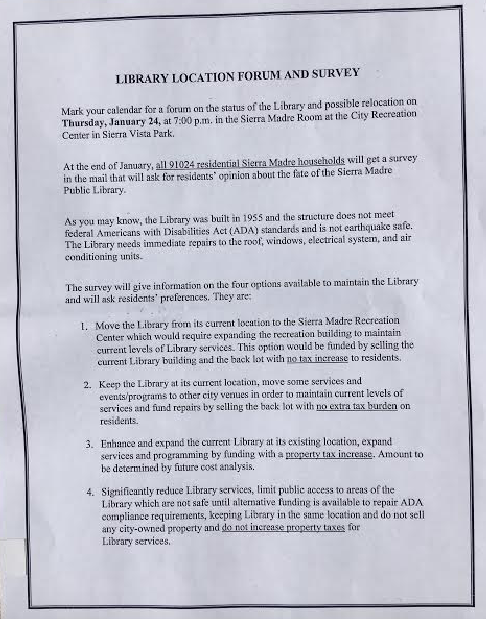 Some of the most influential people behind the Library demolition plan also brought to Sierra Madre its interest only payment water bonds scheme, the One Carter lawsuit mill, along with the Downtown Specific Plan. There is a silver lining to this ominous dark cloud. January 24, which I hope by now you know falls on a Wednesday this year, is also Belly Laugh Day. Here is how Belly Laugh Day is explained on a website called Calendar-365.Com (link). Maybe that flyer, with its bollixed up Library Forum meeting date, is actually a Belly Laugh Day prank? That certainly is one possible explanation. I'll let you know if I hear differently. I have a question. On the cover of the Mtn. Views News there is an article that identifies the 4 candidates up for City Council seats. For the three incumbents their jobs are clearly spelled out. But for Mr. Bencosme he is only identified as a "businessman." Nothing about his being a Century 21 Realtor, or his executive position with the Arcadia Assoc. of Realtors. Was this deliberate do you think? However, it could have been the usual lack of attention to detail on Henderson's part. Wouldn't be the first time there was no effort made to get accurate information. Based on past performance, Treasure Henderson will be deep in the tank for Bencosme. He is the candidate of the Realtors, and she lives off their advertising. There are two political parties in Sierra Madre. There is the Realtor/Developer Party, and the Preservation Party. Bencosme is this year's candidate for the R&D Party. Henderson is their bullhorn. I think Bencosme is running getting into ethical deep water here. How can he be part of the decision making process on selling the library's land when that is what he does for a living right here in Sierra Madre? Didn't the Community Services Commission endorse this sale? How was the flyer distributed? It was mailed out to the "Friends" of the Library mailing list. It was also on the counter at the Library, where I guess nobody read it. Wait a minute, wait a minute! Is this how the public is being notified about the second form? Someone tell me I’m wrong!! No notice in the Skewed Views News. Nothing on the city's Facebook page. Bad info from the Fair Weather Friends. That leaves The Tattler. If anyone knows Joe Feeney please tell him about the “hidden” meeting. If he’s not aware of the scheduled meeting, he’s going to be very upset! I think having the meeting at the recreation center will prove several points as to why the library should NOT be moved there. They will be prooving this point the night of the meeting. Just wait until a certain argument, irrefutable, it made that evening. Oh, yes, that evening being WEDNESDAY, January 24, 2018 at 7 p.m. Damn. Now I am going to have to go. If the Friends can't master this simple level of detail, how are they going to move a library? You misunderstood, this simple detail was by design. It causes confusion and one might miss the meeting. That’s the plan. Who doesn’t know: Who, What, When, Where, Why when announcing a meeting? What a joke! It stinks! It is odd. They really beat the drums for the first forum. On this one? Very quiet. I don't understand. Why wouldn't the city want people to go? 1:28, answer, Many residents don’t want the move to the YAC and that doesn’t fit the “Friends” agenda. Keep a low profile and get the Council to agree. Sell the Library and move to the YAC. It’ll be done under your nose. Remember this move was initiated at 10:15 pm at a Council Meeting. Transparency? No way, It’s a hidden agenda. When is Rueful Grimace Day? Just remember the fools running this 'library operation' have nothing to lose and all to gain from making information hard to acquire plus more fiction along with disinformation spread around the better this will make the tax payers easier to pick off and run in circles. Figures lie and liars figure. "Democrats are holding our Military hostage over their desire to have unchecked illegal immigration. Can’t let that happen!" "I will not be lectured about what our military needs by a five-deferment draft-dodger. And I have a message for cadet bone spurs: If you cared about our military, you'd stop baiting Kim Jong-Un into a war that could put 85,000 American troops .. in danger." Your not sorry. People like you are a one topic person. Yes, Ms. Duckworth has served her country to the extreme and paid a terrible consequence. Wasn’t born with golden spoon in her mouth unlike the Orange Pig living occasionally in White House now. 12:20 - I am sorry to hear you say that. 12:20, loosen your red MAGA hat, it’s cutting off necessary blood flow to what’s left of your brain. 9:58 checking in. 12:20 I'd be happy to discuss or debate any topic you like: law, politics, history, science, math, literature, the abnormal psychology of celebrity (apprentice) worship, etc. Anything. The library, oh the library... the city as well as we citizens cannot afford the library whether it stays at the old location or moves to the new. What if they rented the books? I work with young people. A great majority of them don't use the library. It has been replaced by more comprehensive, faster and more easily accessed sources. With kids it is all digital. So if the library goes digital, how is that different from what they have at home? One book per visit free, a buck a book for others including kids. How many books can you read at the same time? As for research the library is less than useless. Same goes for school visits. The demise of brick and mortar libraries is a hard consequence of the technological revolution we live in. Some people seem to think that their sentimental attachments to a once brilliant and necessary institution is justification for keeping libraries going, as a kind of community park that involves literacy. The desire for a lovely thing of the past never is strong enough to keep it alive when the world no longer needs it. Let’s hope the Grid holds up. No suitcase bombs or Carrington EMP’s. Takes three years to replace a grid, none on standby so have to wait 3 years for China to build one. That’s presupposing China will sell one to us. I can’t imagine a world without Apple/Android devices. Eeeeeeeek! What I think 3:36 is saying is that should the world wide web go down and we will no longer be able to access information on line, there will still be books. Which is good. I have a garage full of them. I want my buggy whip store back. I think it moved to Melrose Avenue. Thanks 4:27. That’s what I meant.....no electricity! Just think about it. I think it was around five years ago that Sierra Madre had those horrible wind storms. We were without power for five days. It was ugly!...and that was only for five days! The closed minded don't realize that libraries are open spaces for the literate. Friends of the Realtors are in full bloom. The don't like seniors (unless they're about to die), they don't like books (unless they're cooked) and they could give two sheets about Sierra Madre (what?! isn't this Arcadia?). Fahrenheit 451 much? I jjust couldn't depardt your site prior to suggesting that I actually enjjoyed the usual information a person provide to your guests? Is going to be again frequently in order to investigate cross-check new posts?